If this were a super hero story, it might be titled “Ant Man meets Godzilla.” It’s about one of the most powerful HF broadcast transmitters on the planet being used with a very low-level signal detection network. Some of you will remember the High Frequency Active Auroral Research Program (HAARP), a super-power HF transmitter antenna array in Gakona, Alaska, and the source of endless nefarious (and untrue) conspiracy theories (weather control, mind control, etc.). Once run by a consortium of universities and government agencies (aha! The government! ), HAARP was shut down for a time, and now has been resurrected under the sole management of the University of Alaska in Fairbanks. 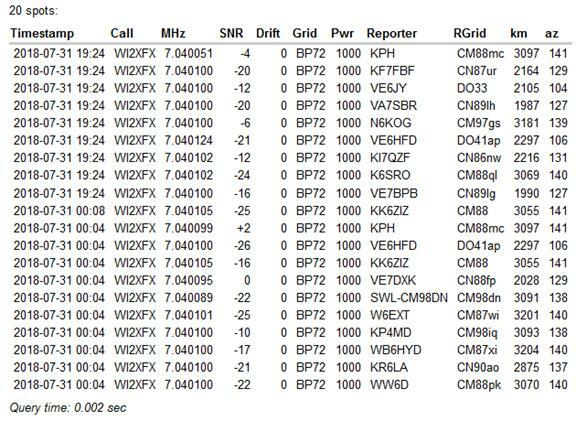 I just went to the WSPRnet.org web site and entered the experimental call sign WI2XFX as a filter. So far, there are just a few 40m reports from stations along the western side of North America. The reported signal levels are not that impressive. Probably because the ionosphere is in pretty bad shape right now, and the F-layer is letting most of the RF go out into space. The lower limit of detection is approximately -28 dB. Some of the signal reports are barely above this level. So get your WSPR ears on and see if you can detect this “monstrous” signal at your QTH. See you at the meeting on August 2nd! The world's most viewed site on global warming and climate change. WASHINGTON — An unlucky coincidence of space and Earth weather in early September 2017 caused radio blackouts for hours during critical hurricane emergency response efforts, according to a new study in Space Weather, a journal of the American Geophysical Union. The new research, which details how the events on the Sun and Earth unfolded side-by-side, could aid in the development of space weather forecasting and response, according to the study’s authors. On September 6, three hurricanes advanced in a menacing line across the Atlantic Ocean. Category 5 Hurricane Irma ravaged Barbuda in the Caribbean’s Leeward Islands in the early morning and churned onward to St. Marin, St. Barthelemy, Anguilla and the Virgin Islands, causing massive damage. Tropical Storm Katia hovered in the Gulf of Mexico and Tropical Storm Jose approached from the open ocean. Both were upgraded to hurricane status later that day. A huge solar flare flashes in the middle of the sun on Sept. 6, 2017. On the surface of the Sun, 150 million kilometers (93 million miles) away, another storm was brewing. A class X-2.2 and major class X-9.3 solar flare erupted on the morning of September 6 at about 8 a.m. local time. NOAA’s Space Weather Prediction Center warned of a strong radio blackout over most the sunlit side of Earth, including the Caribbean. Amateur radio operators assisting with emergency communications in the islands reported to the Hurricane Watch Net that radio communications went down for most of the morning and early afternoon on September 6 because of the Sun’s activity, according to the new study. plane, according to the study’s authors, and NOAA reported on September 14 that high frequency radio, used by aviation, maritime, ham radio, and other emergency bands, was unavailable for up to eight hours on September 6. Another large class-X flare erupted from the Sun on September 10, disrupting radio communication for three hours. The disruption came as the Caribbean community coped with Category 4 Hurricane Jose’s brush with the Leeward Islands and the Bahamas, and Irma’s passage over Little Inagua in the Bahamas on September 8 and passage over Cuba on September 9. The new study detailing the activity on the Sun and its effects on radio communications from September 4 – 13 serves as an overview to a collection of journal articles in Space Weather investigating the solar activity of September 2017. The collision of Earth and space weather in September delivered a reminder that solar events can happen at any time and may coincide with other emergencies, according to the study’s authors. The information in the study could help scientists improve space weather forecasting and response, according to the study’s authors. By understanding how the events on the Sun and Earth unfolded, scientists can better understand how to forecast and prepare for future events, they said. The new study shows the solar flares affected shortwave radio communications, which were being used by amateurs and professionals in emergency response efforts, although it does not detail how emergency efforts may have been affected by the radio blackout. The 2017 flares were the largest since 2005 and the best documented solar storm to date, observed from a fleet of spacecraft between the Earth and the Sun, in Earth’s orbit, on Earth and Mars. Solar flares release bursts of X-rays from the Sun that travel outwards in all directions at the speed of light. Strong flares can disrupt radio and aviation communications. Space weather forecasters have only minutes to broadcast warnings to spacecraft, aviation and other administrators before affects are felt on Earth. X-rays from solar flares interact with Earth’s atmosphere 50-1000 kilometers (30-600 miles) above the Earth, in a region called the ionosphere. Shortwave radio communication works by bouncing signals off the ionosphere and refracting them back to Earth. When the Sun releases a burst of x-rays, like the flares released in early September, the extra energy delivered to the ionosphere can cause it to absorb high frequency radio signals, like those used by ham radio enthusiasts. The September 6 and 10 flares were also accompanied by bursts of high energy solar material explosively ejected from the Sun in an expanding bubble much larger than the Earth. Such coronal mass ejections, which arrive within one to three days, have the potential to wreck the most havoc on human technology. The geomagnetic storms generated by coronal mass ejections can damage power grids, confuse GPS systems and damage or disrupt communication with spacecraft, including weather satellites. geomagnetic storms for September 7-9. The unexpected burst of space weather coincided with high hurricane activity in the Atlantic Ocean. Irma, one of the most powerful Atlantic hurricanes on record with sustained winds of 287 kilometers per hour (175 miles per hour), hit the tiny island of Barbuda at maximum intensity, razing 95 percent of its buildings. The storm destroyed most homes and much infrastructure on St. Martin, Anguilla, Great Inagua and Crooked Island in the Bahamas, and the U.S. and British Virgin Islands. It caused power outages and damage in the Cuban Keys, Turks and Caicos and the southeastern United States. Wind and rain from the storm killed 37 people in the Caribbean and 10 on the U.S. mainland, according the National Hurricane Center. During the September crisis, the Caribbean Emergency and Weather Net logged many “radiograms” relaying survival notes between anxious family members on the islands and the mainland via ham radio operators, Redmon said. Ham radio hobbyists routinely volunteer to disseminate hazard information from the National Weather Service to island communities and ships during major storms, report real-time ground conditions and damages back to the National Hurricane Center, and assist the Red Cross with communications. Graves, the ham radio operator, said many people trapped by storms appreciate hearing a friendly voice over amateur radio relaying the latest weather update, even if they are not able to reply. During a storm, ham radio volunteers strain to listen for lone stations in the affected area that may still be transmitting, Graves said. “A lot of folks in the area were asking us: We heard there’s Jose coming behind Irma, what’s this thing going to do?” he said.